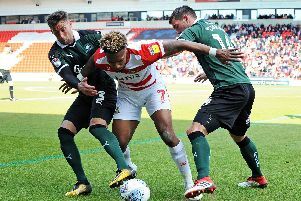 The cost of being handed a ‘free role’ in the Doncaster Rovers side for James Coppinger was a need to deliver goals and assists – and boss Darren Ferguson says he has paid up. Coppinger has netted eight goals this season and laid on a further 12 goals for team mates to help Rovers sit as the joint top scorers in English league football. Rovers’ all time leading appearance maker has played the majority of the season at the tip of a midfield diamond, or sitting off the strikers in a 3-5-2 formation. And being granted the freedom to create came with pressure for the veteran, along with team mate Tommy Rowe. “We knew that those players had to get us goals and assists,” Ferguson told The Star. “I think Tommy and Copps are right up there with assists. “If we’re going to give them, Copps in particular, the flexibility to be the one that overloads certain areas for us, then he had to add goals and he had to add assists. He’s done his job. After several games playing as a left wing back in a 3-5-2, Rowe has returned to a narrower position as part of the switch back to the midfield diamond. Rowe has netted in his last two appearances for Rovers. Ferguson said: “Tommy likes playing as a wing back and he gets goals from there. “But he lets himself go a little bit more in the middle of the park and presses. “You have to be disciplined in both but certainly as a wing back you have to rely on your team mates to get you in the game whereas from the middle of the park you can do it yourself.